Have you thought about the significance of communication within your business? Communication within the workplace is a greater integral factor within an efficient workplace than most initially believe. So how can you advance your workplace communication through design? The habit of staff members eating at desks has a negative impact on the establishment of relationships with colleagues and the communications within the workplace. 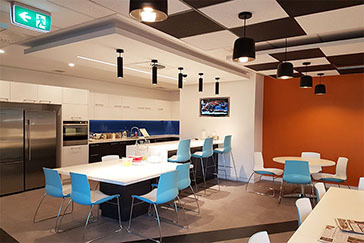 Incorporating a dedicated breakroom provides an area where staff members have a chance to wind down from their work and have authentic discussions with others. Within this space, they are able to solidify meaningful relationships without disrupting others who are working. The modern concept of open plan office spaces continues to be embraced by many working environments. 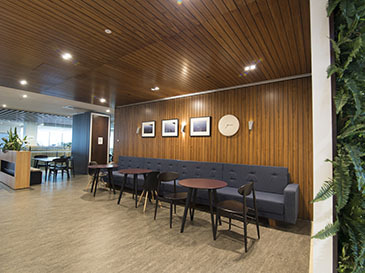 The approach of moving management into an open plan space makes them seem less intimidating and more approachable to employees, harnessing the propensity for increased, spontaneous communications. Open plan working environments physically and metaphorically remove barriers and partitions and therefore promote a more collaborative culture of free-flowing communication and greater cooperation. Wurkspace 7 values workplace communication within any working environments and incorporates various design and construction elements to achieve this aim. Better communication within your business means the staff members can acquire a greater understanding of the company, how it performs, and the responsibilities of their colleagues. From this point staff are better equipped to leverage the capabilities of all members of the business to boost efficiency and productivity. Let Wurkspace 7 guide you in creating an advanced communication flow in your workplace.